Tick three of the UK’s most historical locations off your bucket list with this 4 day trip to Oxford, Worcester and Stratford-upon-Avon. Discover the ancient and modern academia of these famous places as you embark on tours of Shakespeare’s Birthplace, Christ Church College, Kenilworth Castle and much more to learn about the world’s most recognised thinkers and writers. You’ll start your Thinkers and Writers Tour at London’s Paddington Station (approx. 1 hour to Oxford) before you arrive in your first bucket-list city. Oxford, home to world’s oldest English-speaking university, and bursting at the seams with exquisite architecture and history at every turn. With its cobbled streets and quaint boutiques and eateries, you’ll get to feel the quintessential English city at its best as you venture from one famous landmark to another. Tour one of the University of Oxford’s most talked about colleges – Christ Church College. Discover the history of its famous alumni including Lewis Carroll, the author of the fantastical childhood story, Alice in Wonderland, and one of the most historical figures in time, Albert Einstein. After exploring Christ Church College, take a visit to the unique Ashmolean Museum for an adventure back to the Egyptian times where you’ll come up close and personal to Egyptian mummies – unforgettable! Your afternoon exploring will take you to the famous Balliol College, one of the oldest academic institutions in English-speaking world. Built in the 13th century, the College gives an incredible insight into the origin and history of the university. Afterwards, enjoy the views of the exquisite New College, originally built in the 14th century as a miniature Windsor Castle! You’ll also get to visit the famous Corpus Christi College and a real highlight is meeting Fox and Oldham, the two tortoises named after the founders of the College! 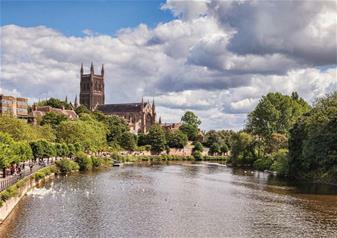 Venture inside the exquisite Worcester Cathedral and come up close to the oldest tomb of an English King, explore the birthplace of Sir Edward Elgar or if you want to soak in spectacular sights, explore Witlet Court and Gardens. Your penultimate day will take you to one of the most famous literary locations in the country – Stratford-upon-Avon. As the birthplace of one of England’s greatest writers, William Shakespeare, this town is bursting at the seams with literature history in abundance. Follow in the footsteps of the Bard as you venture past the gorgeous thatched-roofed cottages and quaint cobbled streets on your journey to Shakespeare’s Birthplace. As a Shakespeare fan, this is one of the hottest tickets in town. You’ll get to go inside Shakespeare’s childhood home and see where he ate, bathed and slept before becoming one of the world’s greatest playwrights! As if that wasn’t enough, you’ll also get to visit Shakespeare’s Schoolroom where his masterful writing skills came to light before taking a tour of the Royal Shakespeare Theatre. Next will be a visit to the historic Kenilworth Castle. Having been both a medieval fortress and Elizabethan Palace, this Castle has been at the centre of England’s rich history throughout the centuries. You can climb up the dizzying heights of the tower, explore the Gatehouse Exhibition and learn about the medieval monarchs and early Tudor Kings that changed the course of British history. Pack your luggage and your life-long memories into a suitcase because it’s time to head back to London! With easy and convenient travel already prepared for you, simply jump on a train from Stratford-upon-Avon station for a journey lasting approximately 2 hours 10 minutes.